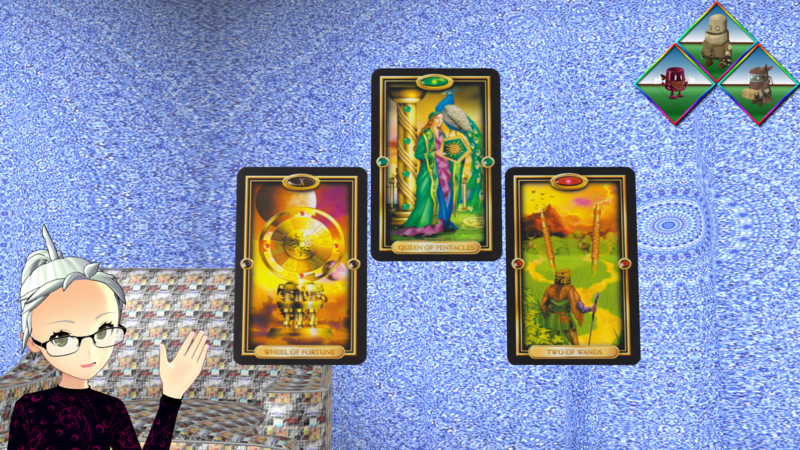 This coming week’s tarot wellness challenge is finding opportunities in how we manage our personal resources through our relationships. Read on for the details! The challenge this coming week is to seek out and take advantage of opportunities that come our way. Monday Button’s position represents the challenge you need to be working on at this time. 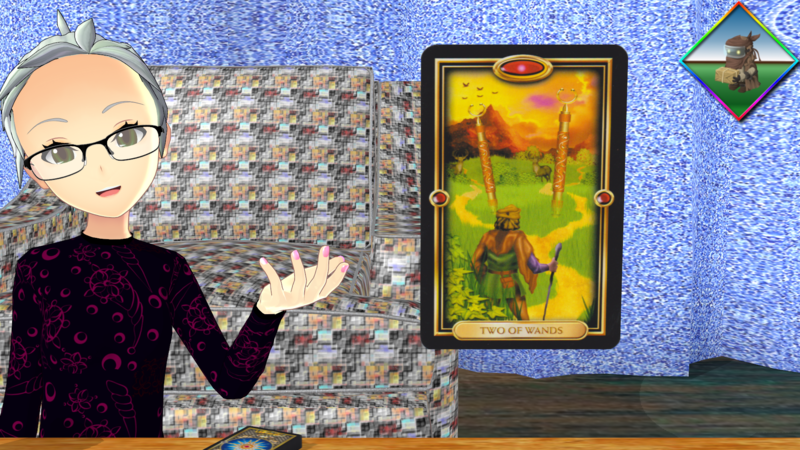 Thus, what you need to be working on right now is found within the Wheel of Fortune. The challenge this coming week is to seek out and take advantage of opportunities that come our way. Good fortune smiles upon the bold after all. The lesson to be learned this coming week is that our greatest asset is found in the people we know and how well we manage our investments with them. Grim Lee’s position represents what you need to be learning while working on your challenge. 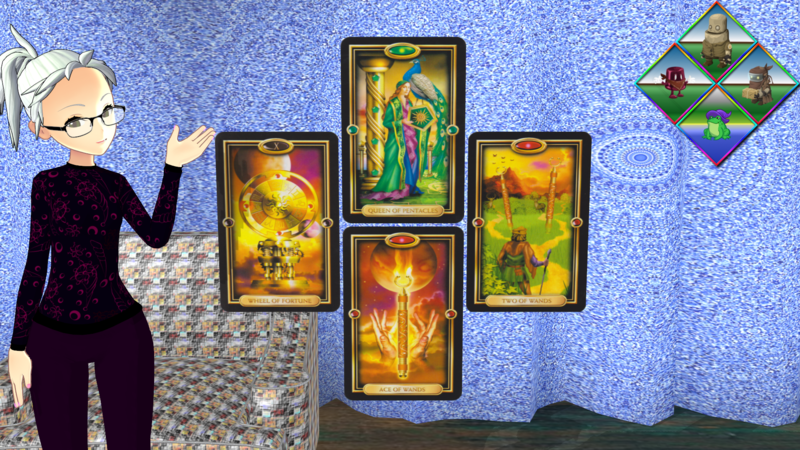 Therefore, your lesson at this time is found within the Queen of Pentacles. 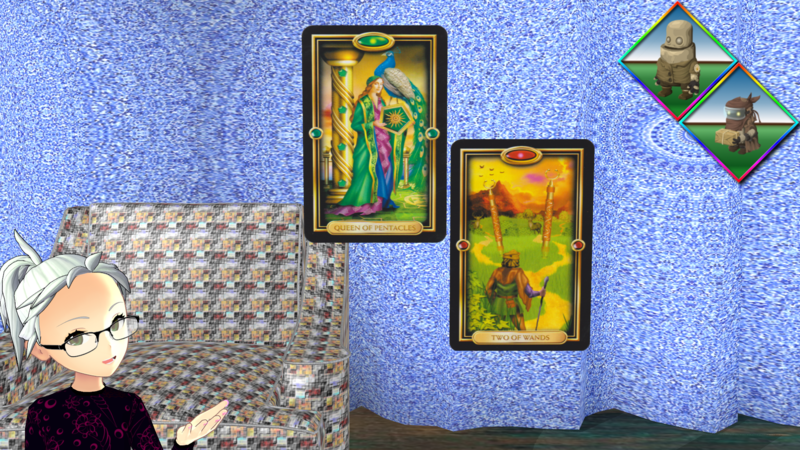 Pentacles often represent resources while Queens often represent the social aspects of their suit. Therefore, the lesson to be learned this coming week is that our greatest asset is found in the people we know and how well we manage our investments with them. Whatever it is you are planning to accomplish this coming week, don’t dismiss the power in the people you know. Whatever it is you are planning to accomplish this coming week, don’t dismiss the power in the people you know. Keep your eyes and ears open for those willing to lend you a hand with your endeavors. The inner lie to overcome here is the belief that there aren’t any choices to choose from. Murphy Law’s position represents the false belief you need to overcome while working on your challenge. 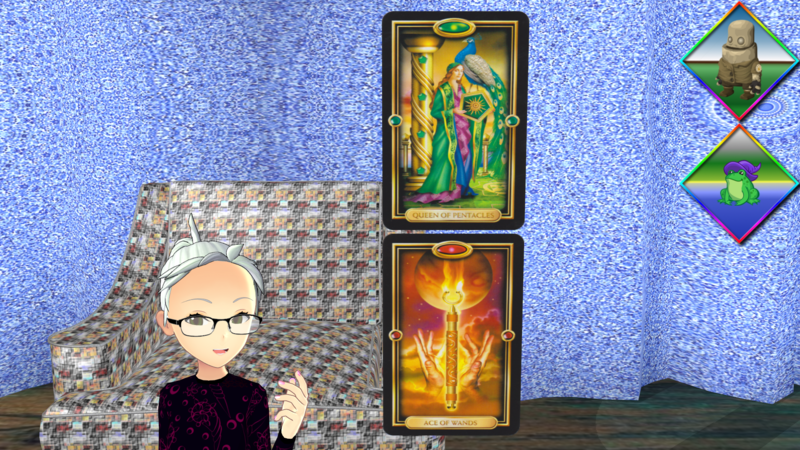 The inner lie at this time is revealed within the Two of Wands. 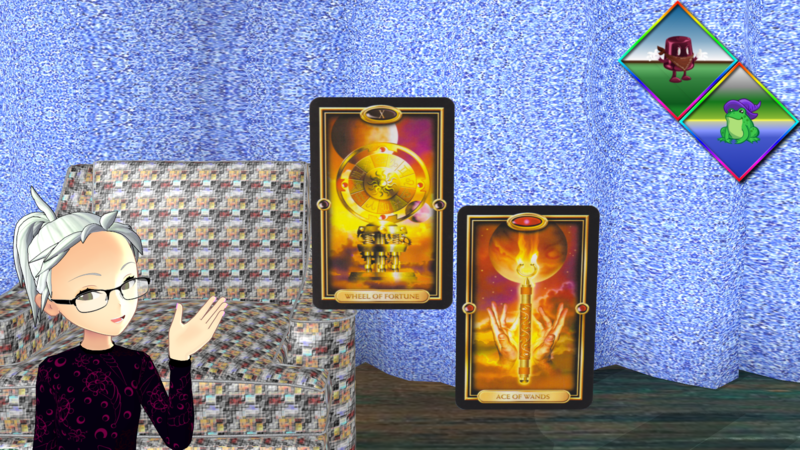 The Two of Wands is about making a choice, so the inner lie to overcome here is the belief that there aren’t any choices to choose from. If opportunity isn’t knocking right now, then you must choose where to build your next door. There are times in life when it feels like there are no options, but the Wheel teaches us that life is nothing more than a series of chain reactions. We get out of it what we put in. This means that opportunities knock on the doors we build. If opportunity isn’t knocking right now, then you must choose where to build your next door. You also have choices within the people and resources you interact with and manage. You’ll have plenty of options to find or build opportunities for yourself by managing your resources through the people you know. 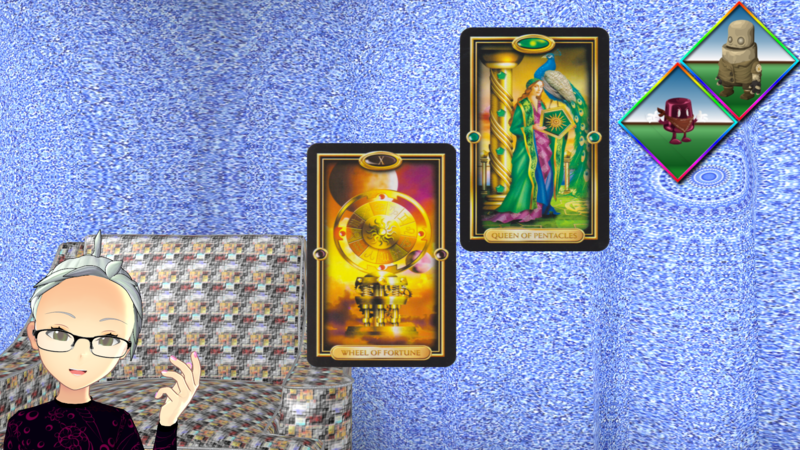 Looking at these three cards together, it’s pretty easy to see that you’ll have plenty of options to find or build opportunities for yourself by managing your resources through the people you know. This coming week have courage and allow your soul to drive you forward. 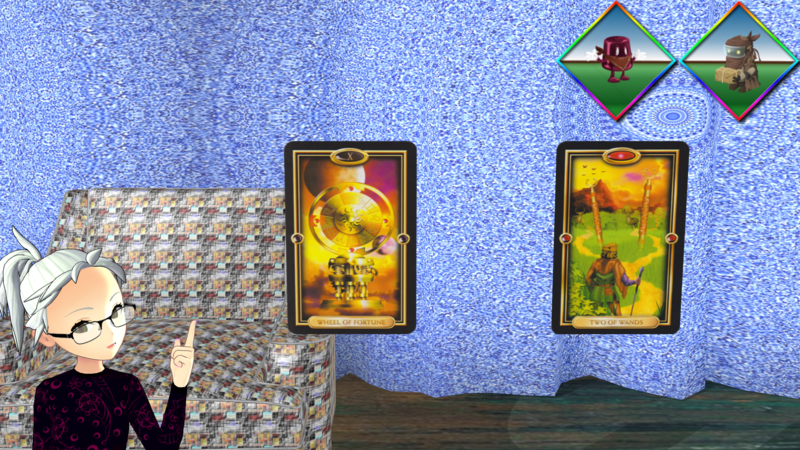 Wise Toad’s position represents the wisdom to keep in mind as you work on your challenge. 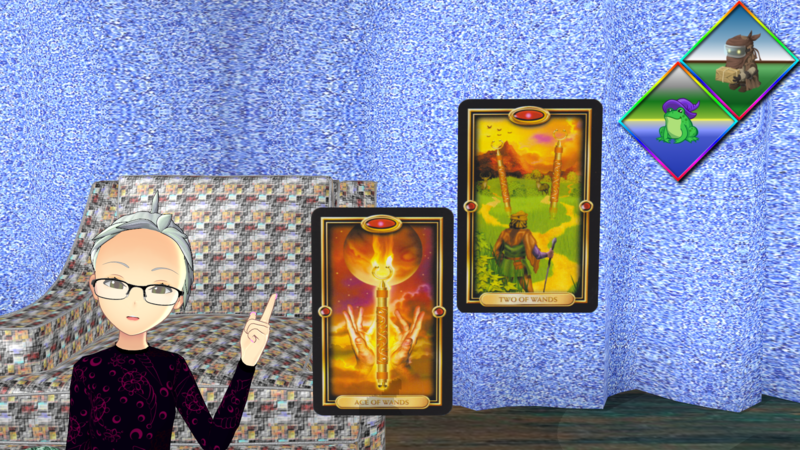 The wisdom you need at this time is found within the Ace of Wands. 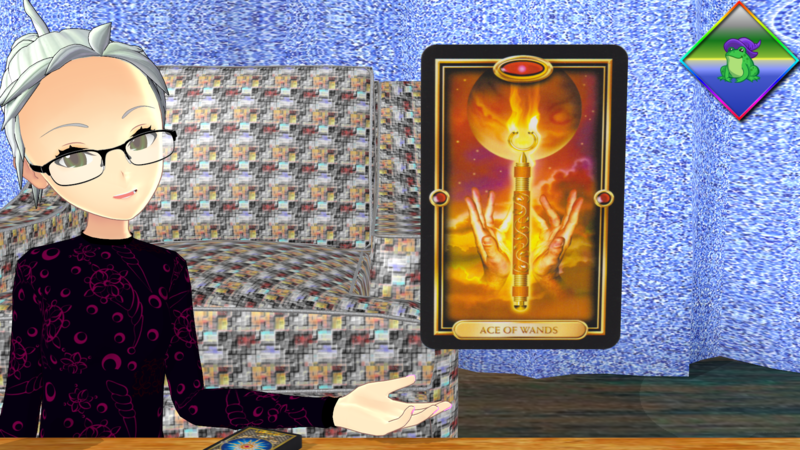 The Ace of Wands represents the gift of the soul and the courage that drives us all. This coming week the wisdom to keep in mind is quite simply to have courage and to allow our soul to drive us forward. Trust in your abilities to find the opportunities you need to reach your goals. Your higher self, the deepest part of your soul, knows where you need to be and how to get there. Trust in your abilities to find the opportunities you need to reach your goals. Don’t be afraid to ask for the help you need from those that resonate with you. Be bold in speaking your truth this coming week. Don’t be afraid to ask for the help you need from those that resonate with you. Listen to your higher self and be bold in choosing your path. Even inaction is a choice. Listen to your higher self and be bold in choosing your path. You always have a choice in life; you only need to take the time to see it. Even inaction is a choice. With courage we can find plenty of opportunities and choices within the way we manage our resources through how we interact with others. Pulling back to examine the entire spread, we can see that with courage we can find plenty of opportunities and choices within the way we manage our resources through how we interact with others.